Paint the backs of all your nails with red nail polish. Do this before applying your top coat so you can remove any red polish that got on your nail beds. Apply your clear top coat. 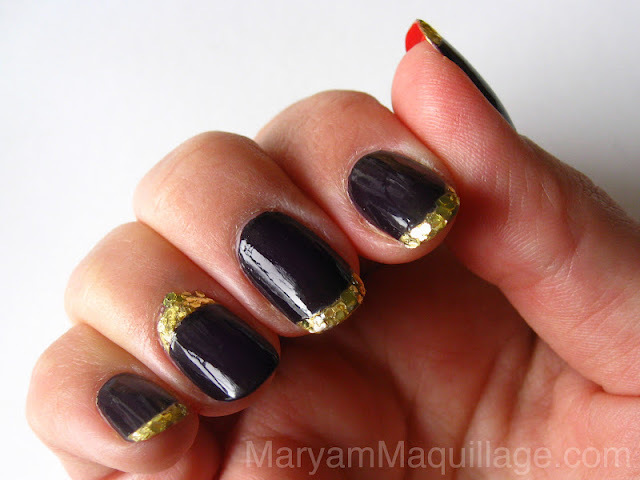 Paint your nails (except your accent nails) with two coats of dark purple polish and wait for it to dry. Paint the tips using a gold nail polish, wait for it to dry, and follow by applying the gold glitter polish on top of the gold tips. My favorite base / top coat is Duri Rejuvacote--look how it shines! Red backs give it a fun twist and also reinforce the tip! Have you tried the painted backs nail trend? Wow love the gold and black! So pretty! I love the look... I am totally scared to try it bc of removal! This mani looks cool! Love it! Do you ever run out of ideas? Great mani look. 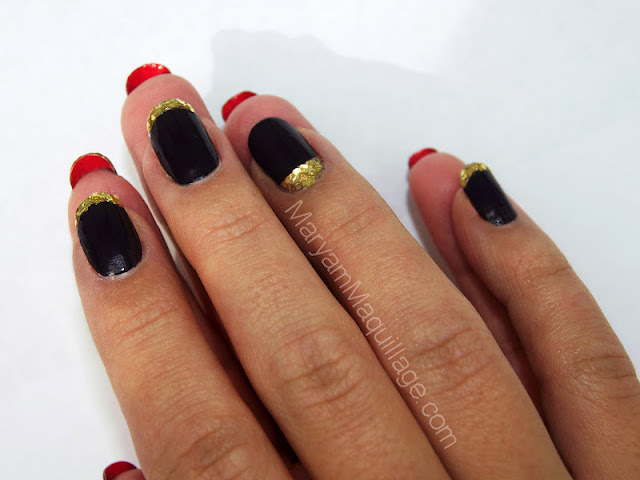 Love your take on the louboutin manicure! OH my! These are so fabulous~ You are so amazing with nail art! you´re such an artist! awesome nail art. Love the touch of gold shimmer - fabulous! You literally take my breath away with your skills. That is soo gorgeous, but something i'd pay money for to get it done. there's no way i can be as neat as you are. You're so amazing what a gift and I just can't seem to understand how ideas come up in your head I mean nails are hard to keep up with but you just amaze me every single time. wow simply gorgeous honeyyyyy!!! I'd ♥ to do this! Beautiful..I love it hun..Love the way you paint your nail both sided.. I love it! It looks sooo luxury! ;o)... Xoxo V.V. You are so creative my dear. The red underneath is very clever. Super cute! I must try it! ; _ ; My nails are too short for this trend. I LOVE that you used a plum color. I had no idea people painted the underside of their nails, the first time I EVER saw it was with Adele at the Grammy's? Now that I'm yours up close I think it looks gorgeous, I need to start doing it myself! Love these nails great job!! Neat! I've never seen anyone do this before, it reminds me of the whole red sole Louboutin thing. Love this nail look! You have created the Louboutin of nails!! We found you through the email that Beautylish sent out yesterday! And we are now following you via GFC. We'd just love it if you visited our blog. Looove this look!! My nails never get long enough to pull this off! Love this!!! It's like having Louboutin shoes on your nails. Very chic and stylish!!! I love your blog, now following you. Follow back? Cool Nail Art Design !! !